We specialize in downsizing and de-cluttering for home sales. We recycle, donate or dispose of items as you request. From the basement to the garage, the yard, and every room in between. 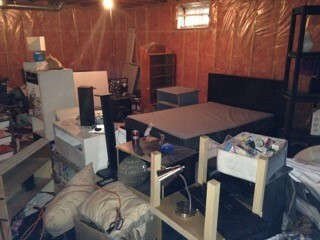 We do the cleanup and junk removal so you don’t have to. Our trucks are big enough to handle any debris, furniture, and waste that you can find to throw away. Kloos Hauling and Demolition performs all tasks involved with residential, home, yard and garage cleanup. We specialize in downsizing and de-cluttering your house, basement, and garage for yard sales, moving out, or just good old-fashioned spring cleaning. We recycle and properly dispose of all waste materials from batteries to bushes. Whether it’s one box or multiple truckloads, we have the team available to clear out your unwanted and unused waste, trash, and debris. Our bobcat services are also available for heavy breaking and lifting for things like concrete pads and demolition waste.